This is how I toast hazelnuts and remove hazelnuts skins. If you have a better method, let me know. Spread a few cups of nuts in a metal baking pan or a large sheet pan with ridges. Bake them in a preheated 350 degree oven for 10-12 minutes or until they are very hot and fragrant. Carefully dump them into a dish towel which you’ve spread across the counter – a ridged dish towel or one with some sort of embroidery works well because it provides more friction. 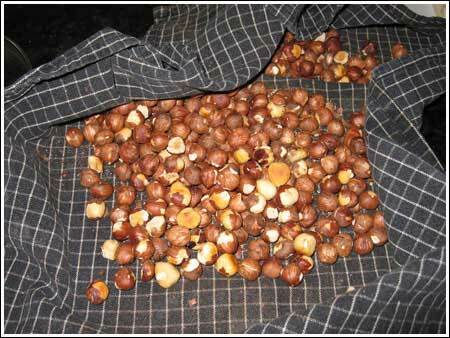 Bring the ends of the dish towel up around the still-hot hazelnuts and wrap them up like a present. Using your hands, rub them between the towel and the work surface so that the friction created by the rubbing loosens the skin. If the nuts are very hot, you may want to wear oven mitts while you press down on the towel. This is very messy, by the way. The skin will not instantly follow off all the nuts. Pick out the ones which have lost the most skin and put them in a separate group. Work on the remaining. As the nuts cool, you can pick up about 5 at a time and rub them in the palm of your hands to remove remaining skin. I use to remove all of the skin. Now I just remove most of it and them. For today’s recipes, a little skin is okay. Remove all of the nuts from the towel. Take the towel in the back yard (lift it up carefully) and shake all the skins off into the air. I usually toast them right before I use them. When you boil the hazelnuts ahead of time, do you freeze them before you toast them (and then toast them after they are defrosted and right before you use them) or do you freeze them already toasted? Recently saw a cook on “Diner’s Drive Inn’s and Dives” boil the walnuts to remove skin, dry or roast them, and cook in simple syrup before using in a Shrimp with Walnut Sauce recipe, said the nuts pick up more of the sweetness?????? Wondering if this would work when preparing nuts for nut roll, baklava, etc. Add your voice to the choir any time! Boiling them all at once and freezing is such a good idea. It’s nice to open the freezer and find hazelnuts which are *almost* ready-to-go. It’s almost as nice as buying them peeled and roasted, but that gets expensive ;). I was making chicken stock, and I knew I had less than no time. Cooking ahead for the weekend, (and cleaning) And really needed a short cut. 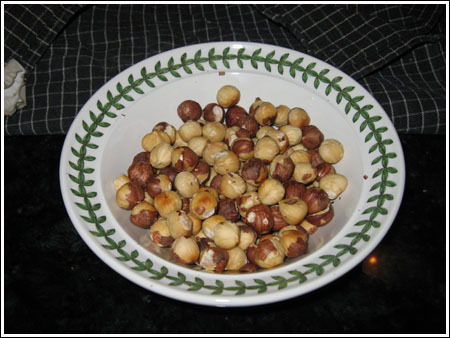 Dumping the hazelnuts in boiled baking soda water, so works!!! Droped the whole thing in the colander, and it’s as if the skin just melts aways. Drying them now on a dish towel. By tomorrow I’ll start toasting them. Thanks so much for the fast and easy tips guys. Even have time for a cup of coffee. (i’m using my hazelnuts in a biscotti. I’ve also used the baking soda/water method with whole almonds for fruitcakes with great success. Got the original idea from The Cake Bible. Anna Olson( Canadian Pastry Chef), dumps them into a colander and then rubs them against it. The skins fall thru the holes( Obviously she does it in the sink). I tried it and it works ok, I think the dishtowel works better. It does foam up! It’s kind of fun. I also boil walnuts sometimes. Boiling them removes the bits of skins and I think, some tannins. It makes them taste a bit cleaner and less bitter. I sometimes boil walnuts if I’ve bought them out of a bulk bin or something like that. I use the baking soda and boiling water trick and it works really good. Make sure you use a big pot though, because it really foams up when you add the baking soda! So funny, because I find the boiling water and baking soda trick to be LESS work. You’re going to toast them anyway. Different strokes for different folks, I guess! I am so glad you posted this! I just bought a bag of hazelnuts today from Trader Joe’s and was wondering how to remove the skins. Joe, I’ve done it with the baking soda too. It’s very effective at removing the skins and the nuts aren’t ruined. However, you do have to dry the nuts and then toast them after you remove the skins, so it’s more work. I’ve heard that some people add them to boiling water with a dash of baking soda added… I want to try that one day, but I’m afraid of ruining the nuts!